One of the founding partners and shareholders of Sv365 Technologies, he is a focused and driven individual who gives everything he can to build his businesses and the business interests of those he works with. Bert believes his extensive history of building successful businesses has taught him many skills, which are essential for today's ever changing and fast paced foodservice/vending industries and payment space. He has been in the hospitality industry for 25 years (the last five years in vending) and Bert won many awards including 'Best pub in Scotland' and 'Best Promotion of the Year' for the entire UK. He was also the Vice President of the Licensed Trade for Scotland. The other founding partner and shareholder, Walter with over thirty years knowledge and experience in the foodservice and vending industries, revels in embracing with passion new opportunities and technologies both on the personal and business front. Learning his trade with Kenco, Kraft General Foods and Sodexo, he decided to start his own business some twenty years ago, and several adventures later, believes he has found his niche! 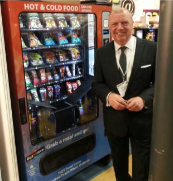 We scour the world sourcing new technologies, innovation and equipment to bring to market products that increase sales, drive efficiencies and enhance new consumer experiences to the UK foodservice and vending industries.